It’s that time of year… Tons of shopping, tons of wrapping, tons of giving and tons of getting. One of the things that are overlooked because of the busyness of the season is the ever classic Thank You! card. One thing I pride myself on is that I ALWAYS write thank you notes. I might even go overboard… I give them to my husband after all haha. To put into words how much you appreciate the thoughtfulness of others is something that will not be taken for granted. I know I always appreciate it, and I can’t think of anyone who doesn’t feel the same way. I thank my grandmother for instilling this quality in me because for as long as I can remember she ensured that my siblings and I composed letters/pictures/etc. to express how grateful we were for gifts we had received. I realize it takes some extra time, but if you prepare BEFORE the gift-exchanging, it’ll make the process a lot easier and much less daunting. Write the note! As children, my grandmother taught us a basic outline to use because our excuse was always “but I don’t know what to write, Nanny!” I still use a glammed up version of what she taught us because it is absolutely fool-proof; nothing is easier than fill-in-the-blank. Thank you for [THE GIFT]. I love it because [A REASON WHY THE GIFT IS PERFECT… i.e. the sweater is my favorite color, the cookies were beyond delicious, I’ll use it all of the time, etc.]. Thank you for thinking of me. I can’t stand the excuse of “but I don’t have time.” If someone had the time to care about you and do something kind, the least you can do is acknowledge it. Whether it be a formal thank you note or even “thanks for thinking of me” scribbled on a post-it note, resolve to do one thing this season… WRITE IT OUT. There is only a little over a week until the Christmas season officially begins! Luckily my first Christmas craft is already done (yay! ), I have coworkers who tolerate pre-season Christmas music (double yay! ), and I am married to a man who is encouraging me to buy more decorations (super yay!). I don’t know how I’m going to last 10 more days without decking the halls, but for the sanity of everyone else, I’m trying. Afterall, it was 75 degrees today… that is not holiday weather! I have so many plans for this year: lots of DIY gifts, tons of Christmas baking, an array of new heirloom decorations, and an abundance of special moments spent with my favorite people (and kitty cat). 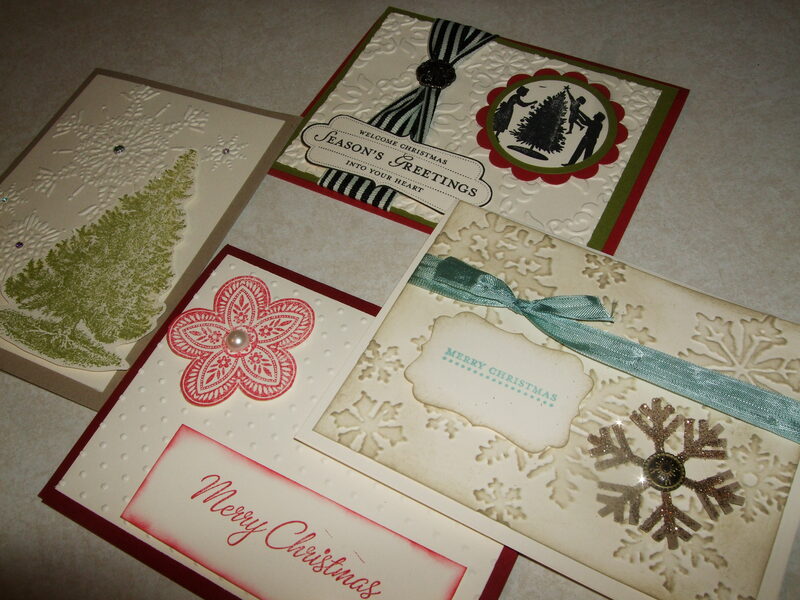 The card-making party this weekend was my unofficial start to the Christmas season and I’m loving it. I think coming home with 20 handmade Christmas cards on Sunday afternoon really helped to kick-start my holiday cheer. Glitter, ribbon, and cute little stamps tend to have that effect on me. Still not sure how these will be used as Joe and I give out photo cards each year, but they are pretty to look at. Rather than keep them junked up in a drawer, maybe I’ll frame them and use them as decorations around the house. Either way, they are leading the way to Christmas and I could not be happier.